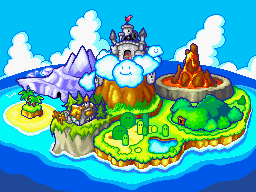 Giddy Sky is the seventh area in the game Super Princess Peach, and, as its name implies, is a sky-themed world. The boss of this world is Kamek, who transforms himself into Giant Kamek. He must be defeated in order to rescue Luigi and gain access to the final area of the game, Bowser's Villa. 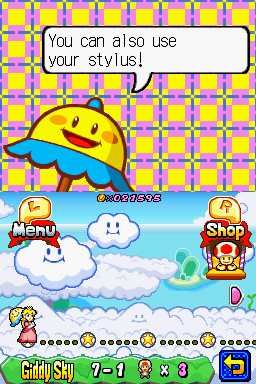 The main inhabitants, such as Lakitus, Paragoombas, Amazing Flyin' Hammer Brothers, Paratroopas, and their corresponding emotional forms, are capable of flight unless Peach jumps on them. There are also hot air balloons that are described as strange devices by the message blocks. Rage is required to make them go up, and there are usually crystals along the way. This page was last edited on February 14, 2019, at 07:27.